I'm watching a lot of Nigella on YouTube these last weeks. Somehow she perfectly works as anti stress for me. Even when I come home from the office really late and go straight to bed, I still turn her on for some 15 minutes. Normally what I watch is a random walk through different series of Nigella bites to Nigella feasts and Nigella kitchen. I haven't yet found a way to get somewhat organized on YouTube. So I'm never sure what I watched already and what not. Thus I bumped into this spicy hot cake for the second time this Saturday when I woke up at 7.30 pm. Yes, I know, not to early even for Saturday. Its magic chemistry was so intriguing and I was so hungry that I made it. 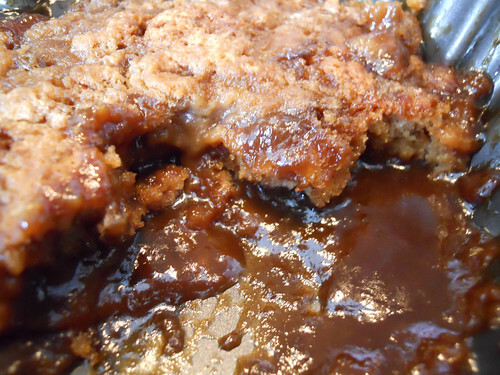 It turned out a great shortcut version of the sticky toffee pudding. No effort and great fun to make. It now definitely goes on my list of favorite simple and delicious recipes. 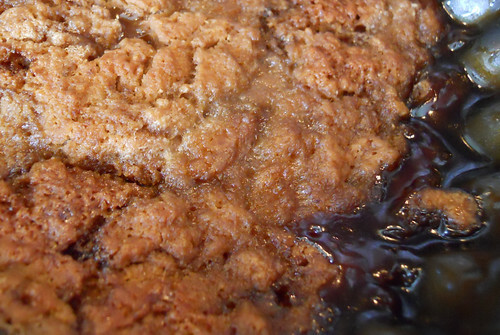 Though the proper sticky toffee pudding I do love and need to make in the nearest future. That was also my first contact with muscovado sugar, which now goes on the list of my favorite ingredients. I should have tried it before. It is so moist, sticky and even spicy - I couldn't tear myself from the box and kept snacking pieces throughout the cooking. To make the butter, mix together the dry ingredients. Add the milk, oil and egg. Mix till smooth. Pour the batter into a greased 23 cm cake pan. Sprinkle over the 200 g of muscavado sugar, ginger, cinnamon. Chop the butter into pieces and place on top of the sugar. Pour over 500 ml of boiling water from the kettle. Bake at 220C for 30 minutes. Take out of the oven and let stand for 10 minutes. Serve hot with vanilla ice-cream, wiped cream or vanilla sauce. Nigella suggests eggnog cream, which also must be delicious. To me the greatest setting for this cake would be just sit together around a table with this steaming baking dish in the middle. Just spooning this pudding crumbling into the sticky sauce out till its gone. It will definitely be gone very soon.